There are many reasons to learn the Icelandic language, which do not include the dialect being spoken across a large part of the world. In fact, only around 330,000 people speak the language from a global population of more than seven billion. One of the main reasons for learning Icelandic is to speak a language different from those the majority of people around the world choose to speak as a second option. When asking why to learn Icelandic, one must remember this is one of the ancient European languages which has a history of its own often taken around the world through the ancient links between the people of the nation and the Vikings. Despite the fact it is one of the least spoken European languages, Icelandic can be learned through the methods which are most popular in the 21st-century. One of the best ways of learning the language is to set out on a pathway using interactive courses on the internet and through books. One of the best-known language learning websites, Memrise offers an introductory course for students hoping to learn as much as possible in a short time. There are a number of Icelandic learning courses to be found on the internet which provides a series of videos including conversations between native speakers to give the student a glimpse into the pace of speaking and tempo of each language. 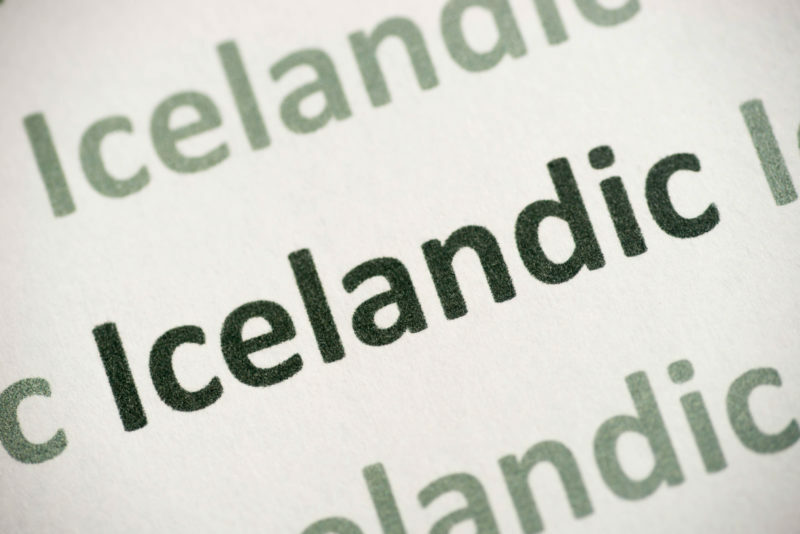 The Icelandic language is closely linked to the Germanic tradition of European languages which includes the German, English, Dutch, and Scandinavian dialects. This is a great bonus for many native speakers of European languages in the same traditions which make it simpler than ever to pick out certain trends and patterns which can be used to ease the learning of each individual. The history of Iceland sees the island nation used as a jumping off point for the explorers from many nations who made their way along the Northern Atlantic Ocean looking for new worlds. The arrival of Germanic languages aided the development of Iceland and led to its language following the patterns of those of the nations which made their way into the country. You may still be asking yourself why to learn Icelandic? A simple answer to that is many of you may have an interest in the Old Norse legends regarding Vikings and explorers in the medieval world. One of the benefits of learning Icelandic is the fact it is spoken by so few people around the world it has largely remained unaltered over the centuries. Why is this a benefit? The number of people speaking the language and entering the nation remains low so it has not been altered by the intrusion of different slang and similar languages bringing change throughout history. Comparing old Icelandic and Old English shows the language of Iceland can still be understood while the English version needs to be translated to be understood. In the modern world, it is important to stand out from the crowd in a job marketplace which is cramped and difficult to navigate. When making the decision to learn Icelandic one may question the need to make a dedicated push to learn a language spoken by so few people. However, this may be the main reason for deciding to learn a language which offers so many resources for learning despite its small population. The island of Iceland has become a popular tourist destination and has a growing influence on the global economy as major technology companies look to expand into areas where servers can be cooled with ease. The Government of Iceland has set up a range of online learning courses and tools which can be accessed for free as the language grows around the world. Other traditional learning tools are also available including traditional books and self-learning tools. The chances are, if you are looking to learn Icelandic you hope to spend some time in the country at some point in the future. Despite the population rarely reaching above 300,000 the nation has become known as one of the happiest and most welcoming in the world. Any trip to Iceland will include chance encounters with local people who are determined to make sure your stay in the country is as happy and filled with fun as possible. Speaking a little Icelandic will be a great icebreaker used to make sure a local person will invite you to a party or get-together with locals in their most impressive bars and clubs. By speaking a little Icelandic, the true identity of the nation and its population will be revealed to you when you finally make your way to the country and start talking to the local people. There are many different parts of the Icelandic language which can be explored through learning Icelandic in even its basic form. In the nation, even the decision to name a child is a little different to that taken in English-speaking nations where surnames are handed down from parent to child. The use of language to create a name includes the name of the father of a child and the suffix, son for a male or dottir for a female child. These names are created to provide a close family link between father and child within Iceland and mark the language of the nation out as different from those in other areas of the world. No matter what the initial reason may be for learning Icelandic, you will probably find yourself drawn to spending some time in the nation as your language exploration continues. Iceland is known as one of the most amazing in the world with a landscape which has inspired many modern artists from musician Damon Albarn to moviemakers including Christopher Nolan. This is not to mention the many local cultural heroes such as Bjork who have taken their own ancient culture and brought it into the mainstream. Understanding even a little of how and why the culture of Iceland developed with a basic understanding of its language will make any journey a little more interesting. The learning of the Icelandic language could set off a lifelong passion for the nation itself which will change the life of the learner in the future.